Mirror, Mirror, on the Wall, What Nations Protect Property Rights Best of All? My favorite annual publication is the Fraser Institute’s Economic Freedom of the World, which measures the amount of economic liberty that exists in 159 nations. 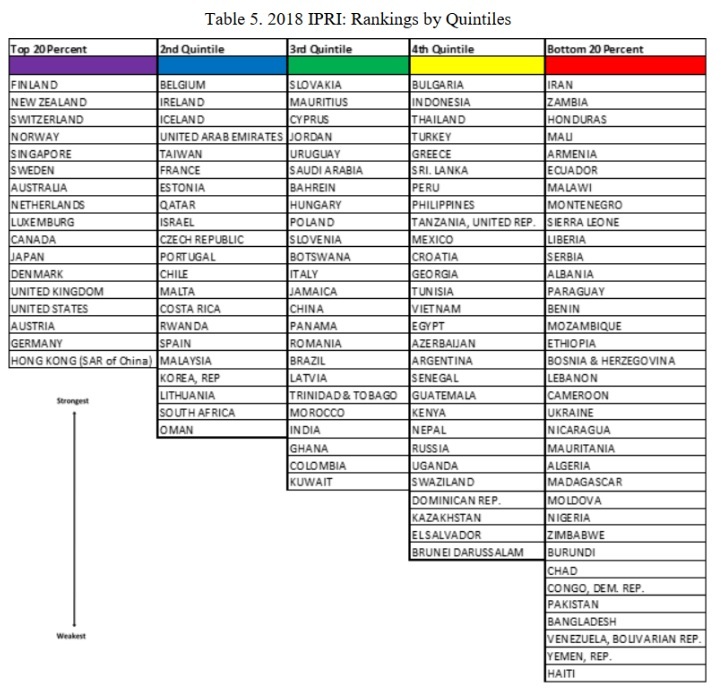 The rankings are based on five equally weighted categories, though I’ve always viewed “Legal System and Property Rights” as being the most important because even low taxes and light regulation won’t produce much growth if investors and entrepreneurs have no faith in the rule of law or the quality of governance. 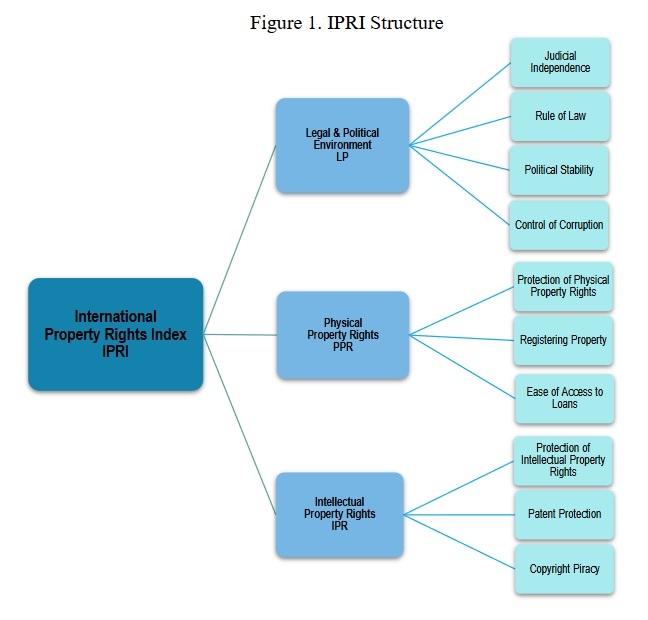 This is why the annual International Property Rights Index is another one of my favorite publications. It provides a detailed look at why the right to own, utilize, and trade property is essential to a free society. Property rights are accepted as a linchpin for human beings’ liberty, acting as a catalyst for economic and societal growth , and as a defense against authoritarian temptations. …Property is the basis of the freedom to contract, which is simply liberty in action. Without freedom to exchange, a third party, generally the government, intervenes through the political-bureaucratic ruling class. Freedom is more than the right to own property or the right to make transactions, to exchange, to buy and sell. Once citizens lose the right to own, they lose the ability to control their own lives. …This Index was developed to serve as a barometer of the state of property rights in all countries of the world. Here’s the methodology of the Index. There are three main categories, each of which is comprised of several indices. Now let’s get to the rankings. As you might expect, Nordic nations and Anglosphere jurisdictions dominate, along with a smattering of other European countries. …the top 15 countries for this year’s IPRI edition. 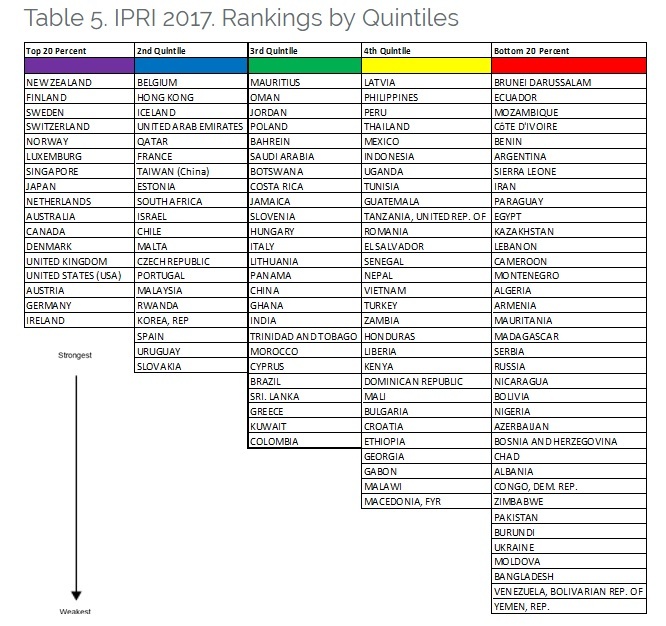 Finland leads the 2018 IPRI (8.6924)… New Zealand ranks second (8.6322)… Next come Switzerland (8.6183), Norway (8.4504), Singapore (8.4049), Sweden (8.3970), Australia (8.3295), Netherlands (8.3252), Luxembourg (8.2978), Canada (8.2947), Japan (8.2315), Denmark (8.1640), United Kingdom (8.1413), United States of America (8.1243), and Austria (8.0050). Congratulations to Finland, New Zealand, and Switzerland for winning the gold, silver, and bronze medals. If you peruse the full rankings below, you’ll see that the United States is #14 (the same as last year). Haiti is in last place, below even Venezuela. It’s also worth noting that Chile is the highest-ranked Latin American nation. Now let’s look at the nations with the biggest movement in the right direction and wrong direction. It’s easy to make a big jump for nations that are ranked very low, so Cyprus (which is now near the top of the 3rd quintile) probably deserves the most applause. This year, five countries show the highest absolute improvement in their IPRI score: Azerbaijan (1.09), Ukraine (0.86), Russia (0.85), Moldova (0.82), and Cyprus (0.79); while the ones with highest decreases in their 2018 IPRI scores were South Africa (-0.65), Ethiopia (-0.3), Liberia (-0.27), Uganda (-0.25), and Uruguay (-0.22). And South Africa’s decline is very tragic since it historically has been one of the best African nations. By the way, if you want to know why property rights are so important, this chart is all the evidence you need. And we’ll close today’s column with a bit of good news. We don’t have decades of data, but the numbers that do exist show continuous improvement. And since we also have evidence that overall global economic liberty is increasing, there are reasons for optimism. There’s an easy way to judge whether countries have good economic policy or bad economic policy. Simply look at the Fraser Institute’s Economic Freedom of the World and check out a nation’s absolute score as well as how it ranks relative to other nations. Size of Government – A measure of the burden of taxes and spending. Regulation – A measure of intervention and red tape. Sound Money – A measure of monetary stability and financial freedom. Freedom to Trade Internationally – A measure of liberty to engage in cross-border commerce. Legal System and Property Rights – A measure of the quality of governance. This last category sometimes doesn’t get enough attention. 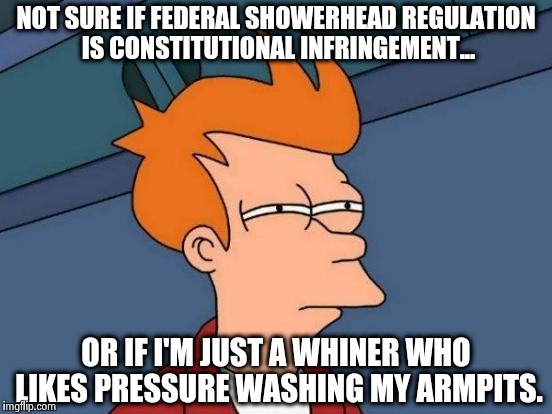 I sometimes refer to it as the rule-of-law measure. It’s basically a way of trying to estimate whether government is doing a good job with institutional public goods. The variables used include 1) Judicial independence, 2) Impartial courts, 3) Protection of property rights, 4) Military interference in rule of law and politics, 5) Integrity of the legal system, 6) Legal enforcement of contracts, 7) Regulatory costs of the sale of real property 8) Reliability of police, and 9) Business costs of crime. Let’s look today at property rights. And I’m motivated to address this issue because of some horrifying news from South Africa. The Wall Street Journal opined on the issue this morning. No country ever became rich through its government’s seizure of private property (exhibit A: the Soviet Union), but politicians in South Africa want to give it another go. That’s the disheartening news from Cape Town this week, where the National Assembly voted 241-83 on Tuesday to start a process to amend the constitution and allow land expropriation without compensation. When I saw the headline and read the opening paragraph, my initial instinct was “so what?” After all, the whites probably stole the land from the blacks in the first place. But then I found out that issue already has been handled. Post-apartheid, the government bought land and offered compensation to South Africans whose property had been forcibly seized after 1913. Many of those claims are now settled… According to a 2016 Institute of Race Relations survey, less than 1% of South Africans think land is one of the country’s “serious unresolved problems.” Unemployment, public services, housing and crime rank far higher. What’s actually happening is hard-core leftist populism. And it may turn South Africa into another Zimbabwe. Huh? Stealing property from everybody, regardless of race, while calling your party Economic Freedom Fighters?!? I guess their idea of freedom means freedom to loot, which is sometimes called – rather perversely – positive liberty. But I shouldn’t laugh too hard because the United States actually had a president with the same twisted mindset. In any event, the WSJ reminds us that this won’t produce good results. The idea is likely to duplicate the awful experience of Zimbabwe during the Robert Mugabe era, a case study in the reality that bureaucrats can’t distribute resources more efficiently or productively than private markets. Mugabe’s confiscations spooked investors, the agricultural industry collapsed, and a once prosperous country became known for hyperinflation and poverty. …the ruling African National Congress is supporting the measure to distract attention from its own failed statist economic policies, which have produced subpar growth and denied opportunity to poor South Africans. …South Africa needs more capital, more investment and a favorable business environment. Seizing private property has produced misery everywhere it has been tried. This is very troubling, especially since South Africa, compared to other nations on the continent, maintained semi-decent policies after dismantling the racist apartheid regime. I wrote back in 2014 about South African economic policy and shared data about the nation’s EFW score. I was worried about the trend, and I’m now even more pessimistic. 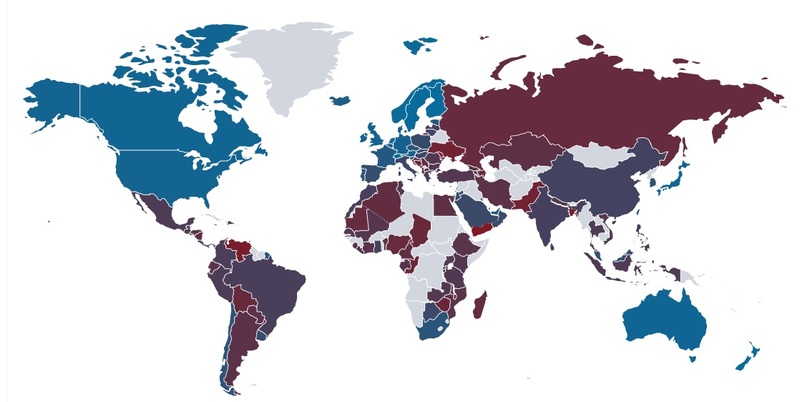 Since today’s topic is property rights, let’s look at the global scores from the International Property Rights Index, which is published each year by the Property Rights Alliance. As you can see, South Africa currently is in the second quintile. Best score of any African country, and above some European nations as well. But if the South African constitution is changed and land expropriation is allowed, it’s a foregone conclusion that the country will suffer a precipitous fall in the rankings. And here’s the map accompanying the study. The bottom line is that blue is good and purple/maroon (or whatever that color is…mauve?) is bad. Switching to other nations, notice that all the Nordic nations are highly ranked. Indeed, they hold three of the top five slots. 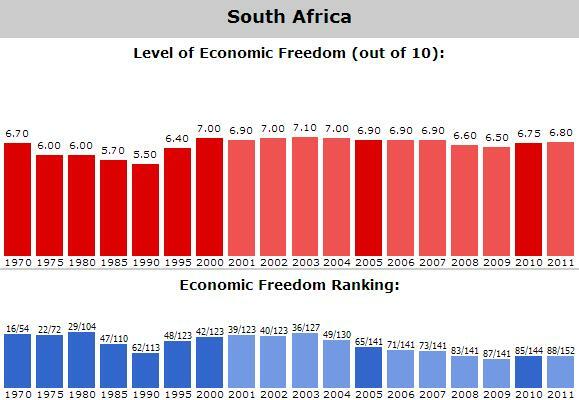 No wonder they score highly in that part of Economic Freedom of the World. Moreover, they also get very good scores for monetary policy, regulatory policy, and trade policy. Which explains why their economies get decent performance notwithstanding very bad fiscal policy. And I’m certainly not surprised that New Zealand has the top spot. The United States also does reasonably well. Not in the top 10, but at least in the top quintile. P.S. In addition to moving in the wrong direction on property rights, South African politicians are making the tax code more destructive. P.P.S. There is a country in sub-Saharan Africa to emulate. …what is needed for better husbandry of ecological resources is more widespread and deeper establishment of property rights together with their enforcement. The cause of environmentalism is often associated with the Left. This is despite the fact that some of the worst environmental outcomes in the history of our planet have been associated with Communist governments. …a great deal of serious work has been produced by those who believe in market or community-based solutions to environmental problems, and a relatively small role for government. For example, Ronald Coase and Elinor Ostrom are two Nobel Prize winners in economics who have made profound contributions to our understanding of how markets and communities can promote environmental conservation. Indeed, the intellectual and moral high ground when it comes to environmentalism ought to be taken by those who believe in private property, strong community institutions and a free economy. And don’t forget green energy programs, which impose heavy costs on consumers and also are a combination of virtue signalling and cronyism. 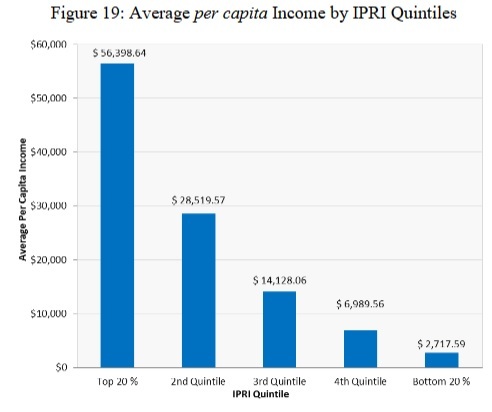 What’s the fundamental problem with redistributionist economic policy? As a libertarian, I would answer with a philosophical argument against coercion. I think it is immoral for vote-seeking politicians, using the threat of imprisonment, to rob Peter to subsidize Paul. But as an economist, the problem is incentives. Simply stated, redistribution from Peter to Paul undermines the incentive of either to produce. And the greater the level of plunder, as we see from extreme examples such as Venezuela and North Korea, the greater the damage. This is a lesson that we should have learned from the earliest days of American history. In a column for the Foundation for Economic Education, Richard Ebeling explains a very important lesson about incentives and human behavior. He begins by pointing out how the Pilgrims initially created a collectivist economic system. The English Puritans…wanted to turn their backs on what they viewed as the materialistic and greedy corruption of the Old World. …they wanted to erect a New Jerusalem that would not only be religiously devout, but be built on a new foundation of communal sharing and social altruism. …all would work and share in common, knowing neither private property nor self-interested acquisitiveness. But this system – what a shock – didn’t work. What resulted is recorded in the journal of Governor William Bradford, the head of the colony. …The less industrious members of the colony came late to their work in the fields, and were slow and easy in their labors. Knowing that they and their families were to receive an equal share of whatever the group produced, they saw little reason to be more diligent their efforts. The harder working among the colonists became resentful that their efforts would be redistributed to the more malingering members of the colony. Soon they, too, were coming late to work and were less energetic in the fields. Commenting about the downside of a system based on communal sharing, Richard shares a simple lesson in economics. 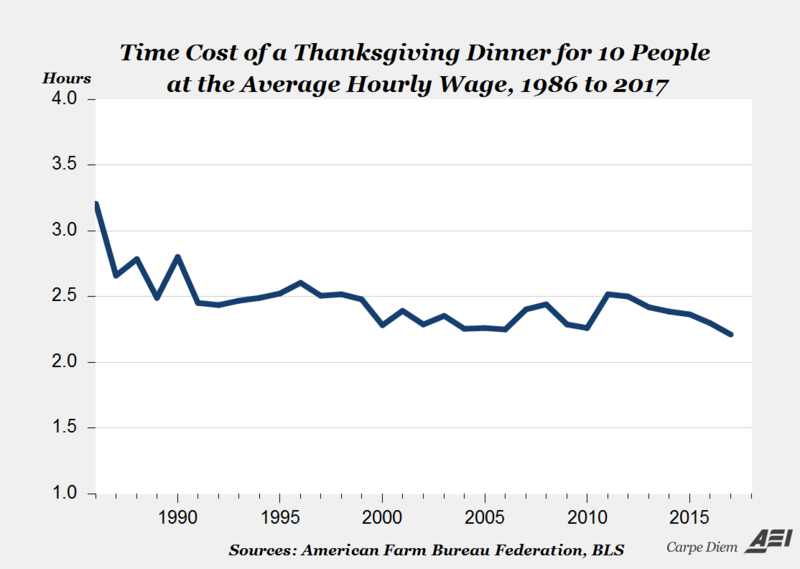 And he also shows the economic lesson to be learned when the Pilgrims abandoned collectivism for private property. Private ownership meant that there was now a close link between work and reward. Industry became the order of the day as the men and women in each family went to the fields on their separate private farms. When the harvest time came, not only did many families produce enough for their own needs, but they had surpluses that they could freely exchange with their neighbors for mutual benefit and improvement. …Hard experience had taught the Plymouth colonists the fallacy and error in the ideas of that since the time of the ancient Greeks had promised paradise through collectivism rather than individualism. …This is the lesson of the First Thanksgiving. …the triumph of capitalism over the failure of collectivism in all its forms. The adverse consequences of 17th-century collectivism are examined in this video from Reason, which I try to share every Thanksgiving. By the way, the Pilgrims weren’t the only early Americans to make the mistake of collectivist economics. An article from the Mises Institute discusses a similar failed experiment in Jamestown. They were to own nothing. They were to receive only as much food and clothing as they needed. Everything that the men secured from trade or produced from the land had to go into the common storehouse. Of the 104 men that started the Jamestown colony in 1607 only 38 survived the first year and even those had to be marched to the fields “to the beat of a drum” simply to grow food to keep them alive in the next year. Fortunately, the Jamestown settlers learned that socialism doesn’t work. And when a system based on private property was created, the results were spectacular. Gee, people produce much more when they keep the fruits of their labor. What a radical concept! On a more serious note, the lessons from Plymouth and Jamestown are the same lessons from France and Cuba. The more government there is in a nation (imagine a spectrum of statism), the worse its economy will perform. 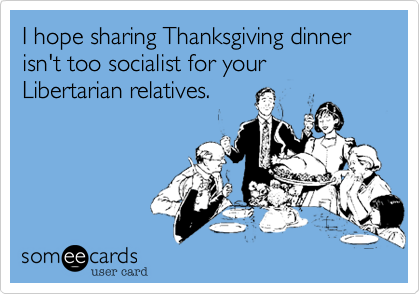 Let’s close with a Thanksgiving-themed addition to our collection of libertarian humor. This guy obviously prefers the moral argument against statism. Not that I would recommend going overboard with libertarian intensity at a family gathering. Then you come across like the libertarian chicken, or the “missionary” from the 24-types-of-libertarians collage. Just have friends and family sign up for International Liberty! I’ve previously argued that private property rights are a vital component of a pro-environment agenda. Interestingly, the Washington Post sort of agrees. At least with regards to fisheries. In a recent editorial, it acknowledged that the current communal system doesn’t work. The world’s fisheries, which feed billions of people, are in serious decline. The authors of a study released Monday in the Proceedings of the National Academy of Sciences examined 4,713 fisheries, accounting for 78 percent of the world’s annual catch, and found that only a third were in decent biological shape. The editorial then points out that there’s an incentive to over-harvest because the oceans are communal property, which creates a “tragedy-of-the-commons” scenario. …while the fishing industry as a whole has an interest in sustaining the fisheries that provide it profits and feed the world, individual fishermen have an incentive to take as much as they can as quickly as they can. Over time, they degrade the fisheries on which they rely, but if they want to stay in business, they have little choice. And the editorial concludes that giving fishermen the property right to a “catch share” would create better incentives. …governments have extremely effective policy options to eliminate this tragedy of the commons. …governments must give fishermen a stake in the overall health of their fisheries. …require fishermen to hold rights to catch a certain amount of seafood in a certain fishery, which allows governments to manage the total haul and reduces the frenzied competition to scoop up as much as possible as quickly as possible. Ideally, these “catch shares” could be bought and sold so that rights would end up with those who could fish most efficiently. Some of the language in the editorial rubs me the wrong way, such as “require fishermen” and “allows governments to manage,” but the bottom line is that the new system would be much more akin to a genuine market based on property rights. To understand, consider the following example. 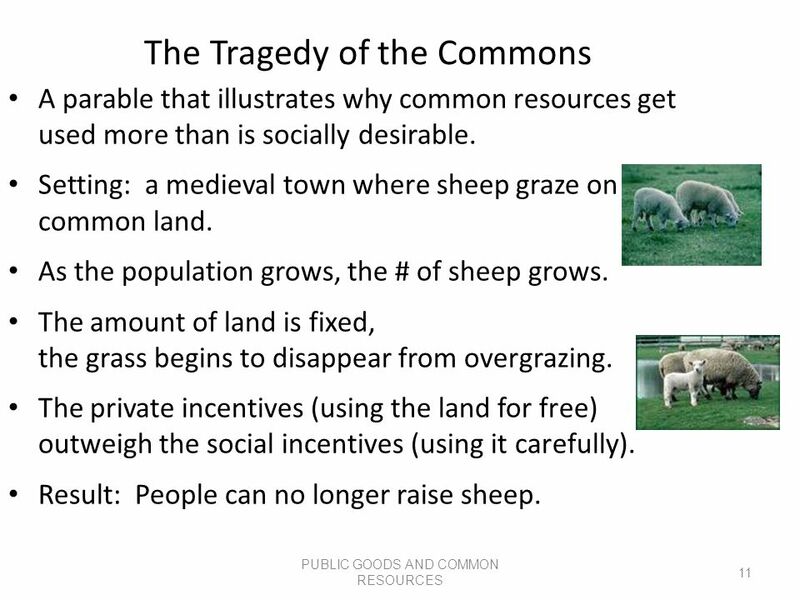 Imagine there’s a communally owned pasture and a bunch of sheep owners. Would there be any incentive for the individual shepherds to properly conserve and manage the pasture? Not really, because any grass that wasn’t eaten by their sheep would be eaten by another shepherd’s sheep. So you wind up with a system where all the shepherds have an incentive to have their sheep consume as much grass as possible as quickly as possible. But what if the pasture was divided up so that each shepherd had a plot of land, along with the right to buy and sell that land? With that system, the incentive to practice good husbandry would radically change. And that’s basically what happens when you create a property rights-based fisheries system. And the Washington Post believes this kind of approach could be enormously beneficial. If applied globally, modern management plans could rehabilitate the median fishery in less than a decade. By 2050, nearly every fishery on the planet would be healthy. The resulting benefits would be astonishing. Relative to business as usual, the refreshed catch would grow by an annual 16 million metric tons, and seafood stocks would rise by 619 million metric tons. Fishermen would see an annual $53 billion rise in profit, a jump of 64 percent. The world’s fisheries could feed more people, and the fishing industry could boom, too. Wow, this is so effusive that it sounds like me describing the benefits of a flat tax. But just like I rely on real-world evidence for my praise of the flat tax, there’s also real-world evidence for successful fisheries based on property rights. Consider, for instance, the experience of New Zealand. By the early 1980s, with dwindling inshore stocks and too many boats, the New Zealand fishing industry and the government realised that a new fisheries management system was needed. Measures such as moratoriums and controlled fisheries failed to work. The common warning that ‘too many boats are chasing too few fish’ was rephrased by one fisherman as, ‘too many boats chasing no fish’. Radical thinking emerged. …In October 1986, after two years of consultation and planning, the Quota Management System was introduced, with widespread industry support. …Under the quota system a sustainable total catch or harvest of fish was set. Individuals or companies were allocated the right to catch certain quantities of particular species. Quotas became like other forms of property – they could be leased, bought, sold or transferred. And how has this system worked? It’s been a big success. 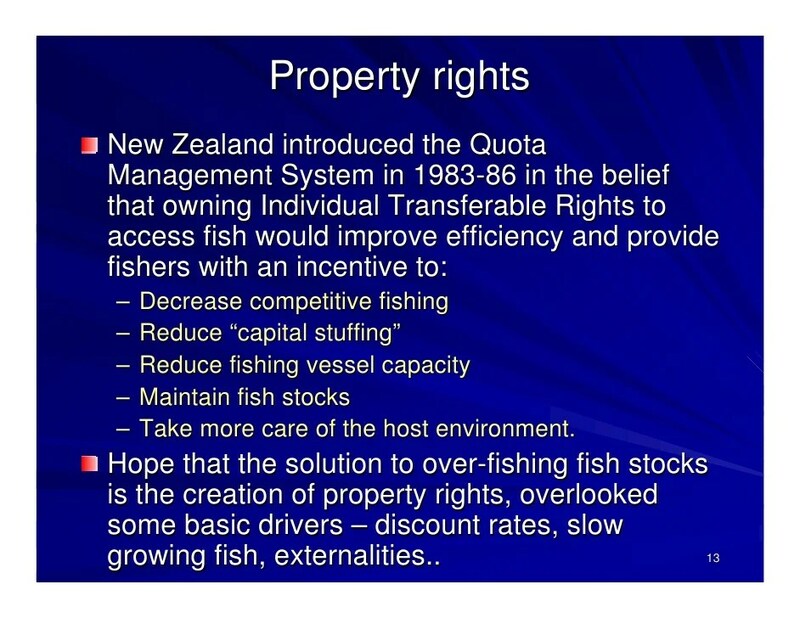 New Zealand’s Quota Management System has been viewed internationally as successful. This is particularly in comparison with many of the world’s fisheries… New Zealand has (so far) largely avoided the significant stock collapses that have occurred in fisheries overseas. In the early 2000s the Ministry of Fisheries had records on the status of 60–70% of stocks. Of these, about 80% were at or near target levels for sustainable harvest, and the total allowable catch for some fish had even increased. The Economist, meanwhile, has written about Iceland’s system. Central to its policy are the individual transferable quotas given to each fishing boat for each species on the basis of her average catch of that fish over a three-year period. …Subject to certain conditions, quotas can be traded among boats. Bycatch must not be discarded. Instead it must be landed and recorded as part of that boat’s quota. If she has exhausted her quota, she must buy one from another boat… All quota changes, catches and landings are posted on the internet, enabling everybody to see what is going on. The idea is to let fishermen be guided by the market. …Iceland no longer suffers from overcapacity, and the catch per boat is increasing. …Iceland offers lessons for other countries. The essential elements of its policies are to give fishermen rights that offer a reasonable expectation of profitable long-term fishing by encouraging the conservation of stocks. The system is clear, open and fairly simple, and it is well policed. It thus enjoys the respect of fishermen. And the contrast to the command-and-control system used by the European Union is dramatic. This contrasts with the common fisheries policy of the EU… For years, the union has simultaneously discouraged and promoted fishing, even as stocks have declined. Overfishing has intensified and the overcapacity of the fleet a few years ago rose to the point where the number of boats was almost twice the number needed for a sustainable harvest. The EU has offered inducements to those who gave up fishing even as it provided subsidies… The EU’s fisheries policy has long been notorious for its destructiveness, epitomised by the practice it either mandates or encourages of chucking back dead fish that are not big enough or not valuable enough, or just the wrong sort. …No wonder the EU’s stocks are 88% overfished, as the European Commission itself now admits. …No minister is present to represent the taxpayer, the consumer or the environment, let alone the fish. The key, everywhere in the world, is a system of property rights. Europe could surely learn from Iceland, but how widely could Iceland’s policies be copied? …The solution for Europe, and for other places, lies in a policy with Icelandic features: transferable quotas for all commercial species… Property rights are nearly always crucial in this. The tragedy of the sea is the tragedy of the commons, which is that anyone with access to a common resource has an interest in over-exploiting it because if he does not, someone else will. …Most fish…live fairly close to land, which is where they can, if the political determination exists, be assigned to the ownership of people with an interest in both exploiting and preserving them for a very long time, if not eternity. That this is so has been shown by Christopher Costello, an economist at the University of California, Santa Barbara, and his colleagues, in a study of over 11,000 fisheries. In the 121 with ownership-share systems, he reported in Science last September, the rates of collapse were significantly lower than in the others. Having “rates of collapse” suggests that the property rights-based systems don’t always work perfectly. But that fact that those rates are “significantly lower” also indicates that they are far more effective than communal fisheries in preserving fish stocks. P.S. There’s a worrisome analogy between communal fisheries and the welfare state since both involve a tragedy of the commons. 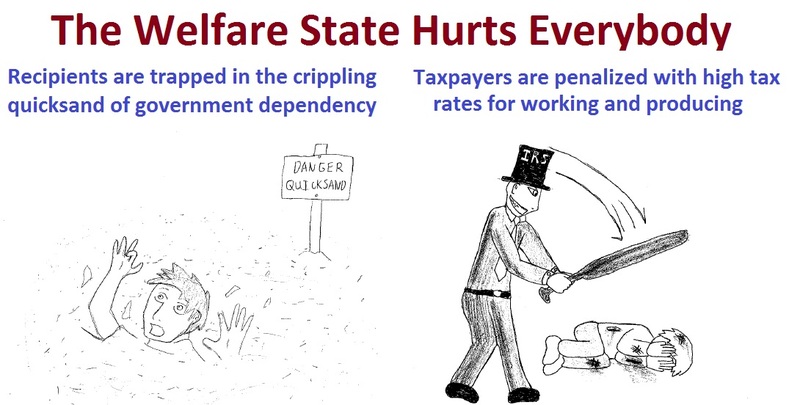 In the case of the welfare state, when too many people decide to rely on the “communal property” of government for their existence, this creates a “tipping point” because productive people at some point are either unable or unwilling to continue pulling the wagon. P.P.S. This is a lesson that the Pilgrims learned very quickly. This century has not been good news for economic liberty in the United States. According to Economic Freedom of the World, America has dropped from being the 3rd-freest economy of the world in 2001 to the 12th-freest economy in the most recent rankings. Perhaps more important, our aggregate score has fallen from 8.20 to 7.81 over the same period. So why has the U.S. score dropped? Was it Bush’s spending binge? Obama’s stimulus boondoggle? All the spending and taxes in Obamacare? The fiscal cliff tax hike? I certainly think all those policies were mistaken, but if you dig into the annual data, America’s score on “size of government” only fell from 7.1 to 7.0 between 2001 and 2012. 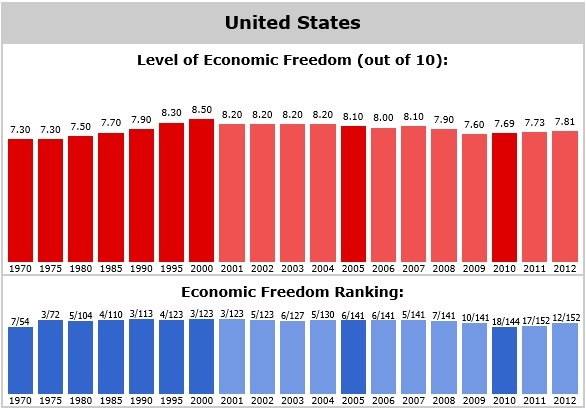 Which means economic freedom in the United States mostly declined for reasons other than fiscal policy. In other words, our score dropped because of what happened to our scores for trade policy, monetary policy, regulatory policy, and property rights and rule of law. That triggered my curiosity. 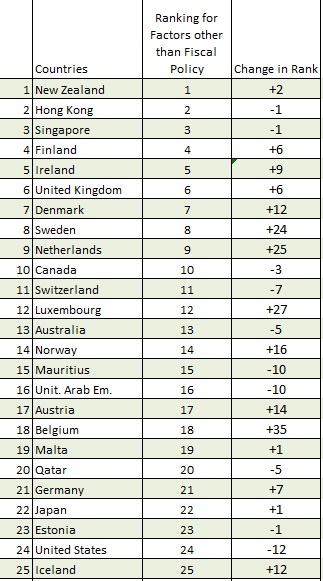 If America is #12 in the overall rankings, how would we rank if fiscal policy was removed from the equation? Here are the results, showing the top 25 jurisdictions based on the four non-fiscal policy factors. 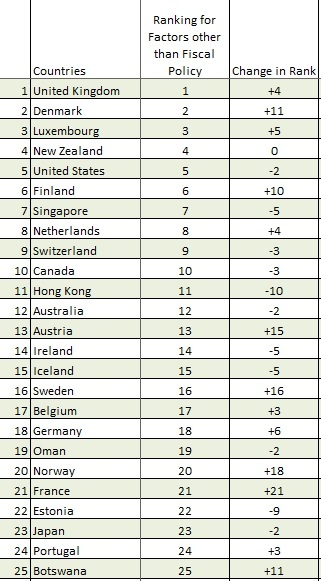 As you can see, the United States drops from #12 to #24, which means we trail 14 European nations in these important measures of economic freedom. If you look in the second column, you’ll notice how many of those European nations have double-digit increases when you look at their non-fiscal rankings compared to their overall rankings. First, their fiscal scores are terrible because of high tax rates and a stifling burden of government spending. Second, these same nations are hyper-free market on issues such as trade, regulation, money, rule of law and property rights. In other words, the data back up points I’ve made about policy in nations such as Denmark and Sweden. In an ideal world, countries should have free markets and small government. In Northern Europe, they manage to get the first part right. Which is important since non-fiscal factors account for 80 percent of a nation’s overall grade. Now let’s return to the issue of America’s decline. Here are the non-fiscal rankings from 2001. As you can see, the United States was #5 at the time, scoring higher than even Singapore and Hong Kong. And the U.S. was behind only three European nations back in 2001. For what it’s worth, America’s score has fallen primarily because of a significant drop in the trade category (from 8.7 to 7.7) and a huge drop for rule of law and property rights (from 8.7 to 7.0). In other words, it’s not good for prosperity when a nation begins to have problems such as protectionism and politicized courts. P.S. The erosion of America’s score for non-fiscal factors is particularly disappointing since improvements in those factors have played a big role in protecting the world from the negative economic consequences of more spending and taxes. P.P.S. I think this is an example of correlation rather than causation, but the above rankings for non-fiscal economic liberty seem somewhat similar to the rankings I shared last week looking at overall societal freedom.